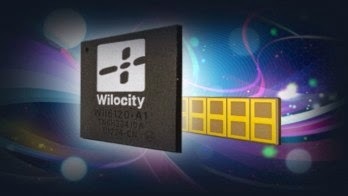 Qualcomm announced today that it will acquire 60GHz WiFi company Wilocity and incorporate the design firm’s products into its own SoC lineup. Wilocity has demonstrated 60GHz WiFi before and previously partnered with manufacturers like Dell to create a line of WiGig chipsets. Some of you may recall the Wireless Gigabit Alliance (WiGig) for short Wilocity uses the term “WiGig” to refer to its product performance but is not affiliated with that group. Qualcomm is buying Wilocity (and into the 60GHz spectrum range) in a bid to boost its long-term wireless performance and product capabilities but 60GHz comes with its own set of challenges and capabilities. On the plus side? It’s fast. Wilocity has demonstrated gigabit WiFi and Qualcomm has stated it intends to build its first WiGig-capable modem (also known as the 802.11ad standard) around the upcoming Snapdragon 810, Qualcomm’s first 20nm SoC. Whether that means we’ll see this hardware inside smartphones in the near-term future is uncertain, but we’ll definitely see adoption over the next few years. WiGig is also well-placed (the 60GHz spectrum doesn’t really interfere with anything else), uses tiny 1-2mm antennas, and is designed for point-to-point transmission it’s much easier to build a network of WiGig devices in the same room than it is to use traditional routers and WiFi networks WiFi performance begins to crater long before WiGig does thanks to intrinsic differences in how signals propogate across the network. But the downside to 60GHz technology is that we’re talking about tiny high-frequency wavelengths that can be attenuated by clothing, furniture, and even ambient humidity. Wilocity’s own documentation shows that performance is markedly better when the lid of a laptop is open vs closed because an open laptop clears more obstructions. 60GHz radio frequencies are often absorbed by O2 to the point that rain can completely block a WiGig signal over distance. 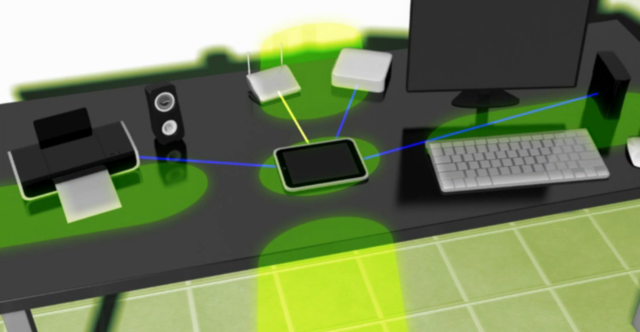 The 802.11ad standard, which incorporates WiGig and 60GHz technology, is designed to fall back to the 2.4GHz and 5GHz bands in the event that this occurs, but we’ll have to wait for real-world hardware to evaluate how smoothly this process happens. 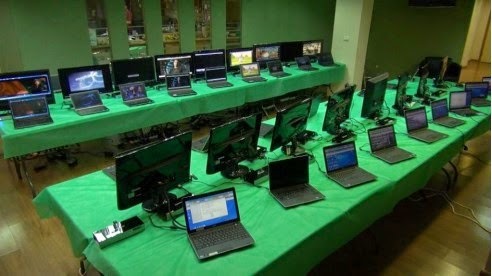 This kind of wireless deployment isn’t very practical using standard tech all the systems shown are streaming HD video. None of these issues mean WiGig can’t be useful in fact, it could be incredibly effective at throwing wireless networks across stadiums or office floors with open floor plans but not unless a great deal of attention is paid to how network hardware is positioned and configured. Qualcomm claims it will use wiGig technology for streaming 4K wirelessly to smartphones, tablets, and traditional PCs. For those of you confused about the acronyms flying around, the 60GHz/802.11ad standard used by Wilocity is not the same as the farther-out 802.11ax standard we covered a few weeks back. 802.11ad is an update to 802.11ac, whereas 802.11ax is an entirely new animal with its own significant development period and ramp up ahead of it. While it’s not the focus of today’s announcement, Wilocity also had a virtualized, wireless PCI-Express technology, dubbed wPCIe. wPCIe is designed to be a wireless extension of the PCIe bus that the PC can treat just like it would treat a physically connected peripheral. There’s no word on whether Qualcomm intends to commercialize this technology or if it’ll be sold to a different company.